Following the 1937 original, and two further remakes starring Judy Garland in 1954 and Barbra Streisand in 1976, the current version of A Star is Born has been in the pipeline for some time. With Steven Spielberg and Clint Eastwood expressing interest in directing, and Beyoncé attached as the lead for some time, the final product is brought to the screen by Bradley Cooper, with Lady Gaga as its star. Ally (Gaga) is a singer/songwriter working as a waitress and moonlighting in a drag bar. She has a sensational voice but believes her appearance has held her back. Her father (Andrew Dice Clay) laments that similarly there were many performers just as good, if not better, than Frank Sinatra, but that he made it due to his blue eyes and sharp suits. Yeah, thanks Dad. Jackson Maine (Bradley Cooper) is one who has made it, performing country hits in sold out stadiums to thousands, before hitting the bottle post-gig. After one gig, in search of booze, he happens upon the drag bar where Ally performs, and is immediately drawn to her presence. A whirlwind romance begins, and he invites Ally on stage to perform one of her own songs. Before long Ally has reached the heights of, well, Gaga herself, while Jack spirals deeper into his alcoholism. It’s interesting to consider how different this film would be as an Eastwood/Beyoncé vehicle. Gaga’s songs are all co-written by her, and many of these have a country edge which compliments Cooper’s character. With Queen Bee as the star it would most likely have gone in vastly different directions, and with a very different sound. What we do end up with seems to obviously parallel Gaga’s own ascent to stardom. (YouTube her early gigs in dimly lit bars where she went by her original name, Stefani Germanotta, wore black, and had messy dark hair.) There’s a moment in the film where a suggestion is made for Ally to dye her hair platinum blonde which is immediately shot down in favour of a vibrant orange. It works as a cute little gag that differentiates Ally from Gaga, but there’s no denying the obvious parallels. If you’re still hell intent on denying that Gaga is one super talented lady, I dare you to see this film and tell me otherwise. The woman can most certainly sing, and she gives a raw, vulnerable acting performance, singing live. She has written some sensational songs for the film, including the main track ‘Shallow’. While much of it has a country edge, there’s a few trademark Gaga ballads (‘Always Remember Us This Way’), some standard dancefloor pop (‘Why Did You Do That?’), pop with a soul edge (‘Look What I Found’) and the final showstopper with strong Whitney vibes (‘I’ll Never Love Again’). If you come away from this film still not convinced of Gaga’s magnificence, you’re either deaf or you hate everything that is beautiful in this world. Bradley Cooper, too, gives a fine performance, digging deep in his portrayal of Jack. He’s played the bitter/addict role before (Silver Linings Playbook, Burnt) but these have always usually involved an ultimately sunny outlook. Jack is a darker turn for Cooper, and he goes all in. What’s even more impressive is that this is Cooper’s directing debut (with a Leonard Bernstein biopic lined up next), and he has delivered what is currently the frontrunner for Oscar glory. Here he keeps a tight focus on Ally and Jack, producing an intimate portrayal of two souls in the midst of a crazy and adoring world. Matthew Libatique contributes some memorable cinematography including a great scene where Jack speaks to Ally with the bodies of her backup dancers writhing in the background. A Star is Born is first and foremost a love story before anything else. Ally and Jack’s relationship is no Hollywood romance; it’s complicated, draining, and scattered with hurdles. But despite the darkness, their fierce love for one another is evident, and Gaga and Cooper’s chemistry is strong. 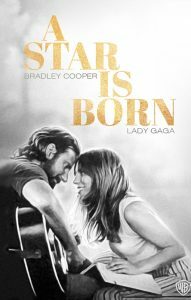 Aided with some brilliant tracks and the sense that you’re seeing Gaga’s true rise to stardom, this film will send jolts down your spine and leave a lump in your throat. This review was first published on 14th October 2018 at Film Blerg.